$22,265.00 RAISED FOR BEAUTY ON THE WING!!! $22,265.00!!! RAISED FOR BEAUTY ON THE WING DOCUMENTARY! THANK YOU KIND DONORS!!!!!!!!!!! WITH THE GREATEST APPRECIATION FOR OUR COMMUNITY OF FRIENDS AND SPONSORS, I AM OVERJOYED TO SHARE THAT TO DATE WE HAVE RAISED $22,265.00 FOR THE DOCUMENTARY FILM “BEAUTY ON THE WING” ONLINE FUNDRAISER!!! MY DEEPEST THANKS AND GRATITUDE TO LAUREN MERCADANTE (PRODUCER), SUSAN FREY (PRODUCER), NEW ENGLAND BIOLABS FOUNDATION, BOB AND JAN CRANDALL, MARY WEISSBLUM, SHERMAN MORSS, JAY FEATHERSTONE, MARION F., ELAINE M., KIMBERLY MCGOVERN, DONNA STOMAN, PEGGY O’MALLEY, JOEY C., CATHERINE RYAN, JOEANN HART, JANE PAZNIK BONDARIN (NEW YORK), ROBERT REDIS (NEW YORK), NUBAR ALEXANIAN, PETER VAN DEMARK, PATRICIA VAN DERPOOL, FRED FREDERICKS (CHELMSFORD), LESLIE HEFFRON, JIM MASCIARELLI, DAVE MOORE (KOREA), LILIAN AND CRAIG OLMSTEAD, JOHN STEIGER, PAT DALPIAZ, AMY KERR, BARBARA T. (JEWETT, NY), ROBERTA C. ((NY), MARIANNE G. (WINDHAM, NY), PAULA RYAN O’BRIEN (WALTON, NY), MARTHA SWANSON, KIM TEIGER, JUDITH FOLEY (WOBURN), PATTI SULLIVAN, RONN FARREN, SUSAN NADWORNY (MELROSE), HEIDI SHRIVER (PENNSYLVANIA), JENNIFER CULLEN, TOM HAUCK, AND ANONYMOUS PERSONS FOR THEIR GENEROUS HELP. Donors contributing $20.00 or more will be invited to a very special screening preview party of the documentary Beauty on the Wing: Life Story of the Monarch Butterfly. Consider the cost of a movie ticket, beverage, and popcorn is $20.00. By contributing to the film’s online fundraising campaign, you will help bring it to theaters and classrooms. Contributors will be invited to the film’s preview screening party and be amongst the first to see this stunning film! One of the many ways that you will find Beauty on the Wing to be unique is that it was filmed entirely on location, outdoors, and in nature. There are absolutely no computer generated graphics. The life cycle scenes were filmed on Cape Ann, in meadows, dunes, and gardens (not laboratories). Flight scenes are not simulated, but filmed on location, predominantly on Cape Ann, some in Angangueo, and also Santa Barbara, Westport, Cape May, and Stone Harbor Point. 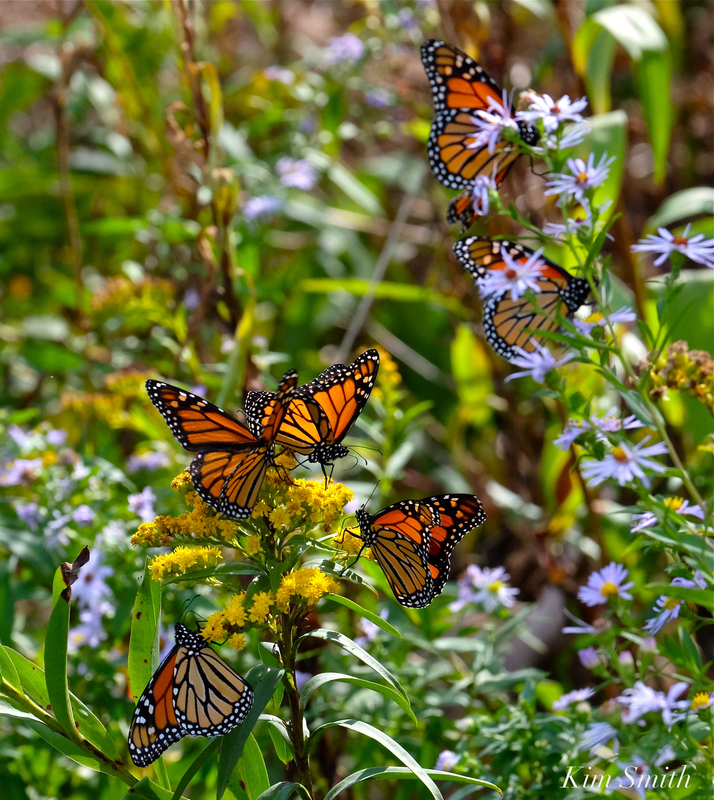 Mostly though, through story telling and cinematography, the film shines a beautiful light on the Monarch migration as it unfolds on the shores of Cape Ann, portraying our community and the natural world of Cape Ann as we would hope to be revealed to the world at large. This entry was posted in Gloucester Massachusetts, Lepidoptera, Monarch Butterfly, Monarch Butterfly Film and tagged Beauty on the Wing ~ Life Story of the Monarch Butterfly, Cape Ann, film screening, Fundraiser, Monarch butterfly, Monarch Butterfly Film, Monarch Butterfly Habiatat, Monarch Butterfly Habitat, Monarch Butterfly Migration, preview party, Purple-stemmed Aster, screening offer, Seaside Goldenrod on November 5, 2017 by Kim Smith.